Welcome to Ban Nong San, one of Sakon Nakhon's signature indigo dyeing communities. We look forward to showing you our local ways of life through weaving and indigo dyeing as well as farming. In fact, you will not only see but also eat and do what we do. Let's experience Isan like locals. Arrive at Ban Nong San. Enjoy riding an E-Taek car (multi-purpose farm car) and sightseeing around our community. It's a bumpy but very fun ride! If you visit during the rice farming season, you will get to learn about and try traditional organic rice farming from Auntie Aoy (the owner of Sommanus Farm). If you come during the harvesting season, enjoy the harvest. Sommanus Farm tour by Auntie Aoy. Let's harvest the homegrown vegetables and have lunch. You can also try cooking yourself. Natural indigo dyeing workshop. This is one of Ban Nong San's highlights. 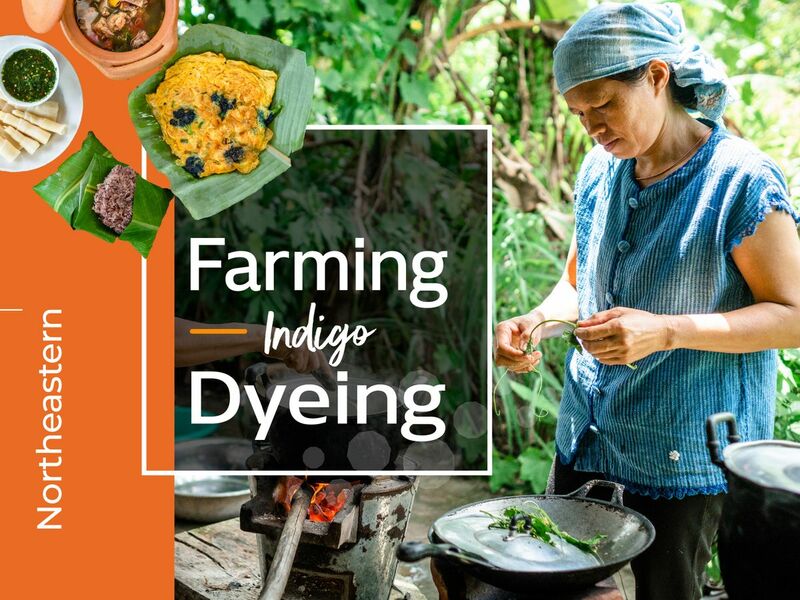 It's a fun activity and you can see how the green plants amazingly turn your clothes into indigo. End of the trip. We can take you to Sakon Nakhon Airport.